In Stock: One only, Last One! 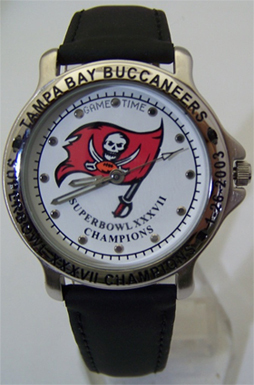 Click the button below to add the Tampa Bay Buccaneers Super Bowl Watch Commemorative XXXVII Wristwatch to your wish list. Tampa Bay Buccaneers Super Bowl XXXVII Watch, New. 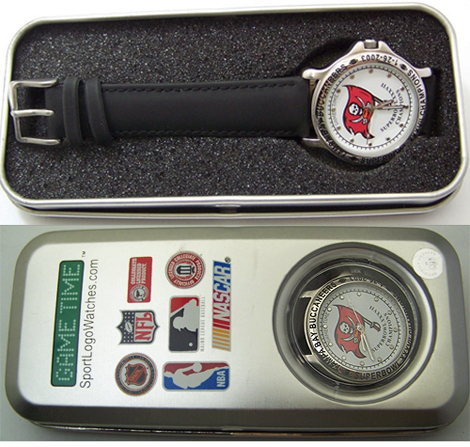 Game Time Player Commemorative Wristwatch in tin. NFL Football sports fans teams logo SuperBowl watches. Photos are of actual item being purchased. One only, In hand, so ships NOW! Tampa Bay Buccaneers Super Bowl XXXVii watch. Game Time commemorative wristwatch in special tin. This is a new never worn working collectible three hand analog watch with team logo and Super Bowl Champions designation on the watch face. Comes on an 18 mm black leather band. Case diameter is 36mm, quartz movement. Released as a mens watch this size is also now a popular oversized womens watch. 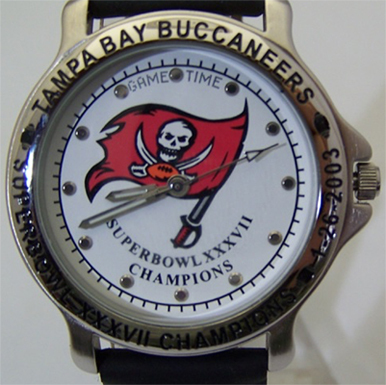 The team name and game date 1-6-2003 is written around the outer edge of the bezel, The Buccaneers defeated the Raiders 48- 21.